We’d love your help. Let us know what’s wrong with this preview of The Sixties by Todd Gitlin. Say "the Sixties" and the images start coming, images of a time when all authority was defied and millions of young Americans thought they could change the world--either through music, drugs, and universal love or by "putting their bodies on the line" against injustice and war. Todd Gitlin, the highly regarded writer, media critic, and professor of sociology at the Say "the Sixties" and the images start coming, images of a time when all authority was defied and millions of young Americans thought they could change the world--either through music, drugs, and universal love or by "putting their bodies on the line" against injustice and war. To ask other readers questions about The Sixties, please sign up. 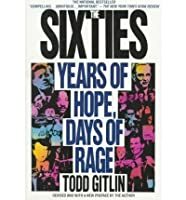 Fascinating memoir of Todd Gitlin's journey through the radical movements of the 1960s. I especially appreciated the detail about the very early period, late 50s and early 60s, which are often disregarded in popular treatments of the era. Gitlin's writing is very literary/academic in style, and is consistent with a lot of other writing from the 1960s, something that I think many people would be surprised by. The driving personalities of that time were college students and extremely intelligent y Fascinating memoir of Todd Gitlin's journey through the radical movements of the 1960s. I especially appreciated the detail about the very early period, late 50s and early 60s, which are often disregarded in popular treatments of the era. Gitlin's writing is very literary/academic in style, and is consistent with a lot of other writing from the 1960s, something that I think many people would be surprised by. The driving personalities of that time were college students and extremely intelligent young adults, and they tended to be both extreme and intellectual at the same time, heavy readers of dense political material and endless debaters. This is a stark difference from the current trend to not read at all and think in highly simplistic and "dumbed down" terms. I don't often write negative things about books, since even the worst among them generally has some useful ideas or at least expands your mind by challenging a firmly-held opinion. Unfortunately I cannot in good faith say any of these things about Todd Gitlin. Gitlin's writings are so pernicious precisely because they lull you into a false sense of intellectual security; Gitlin's book has about as much use for serious historians and activists as the movie Forrest Gump. It's rare indeed that a bo I don't often write negative things about books, since even the worst among them generally has some useful ideas or at least expands your mind by challenging a firmly-held opinion. Unfortunately I cannot in good faith say any of these things about Todd Gitlin. Gitlin's writings are so pernicious precisely because they lull you into a false sense of intellectual security; Gitlin's book has about as much use for serious historians and activists as the movie Forrest Gump. It's rare indeed that a book can be trenchantly criticized both from the left and the right, however, two authors do just that to Gitlin's Years of Hope, Days of Rage and to much greater effect than the original. Max Elbaum's Revolution in the Air traces the revolutionary currents of the 1960s through the 1970s and 1980s in an intelligent fashion, while criticizing Gitlin's simplistic and omission-laded "Good Sixties vs Bad Sixties" narrative. From a different angle, Eric Leif Davin's under-appreciated Radicals in Power: The New Left Experience in Office challenges Gitlin's thesis as well, taking the author on for deliberately ignoring Leftist involvement in grassroots electoral campaigns and "perpetuating the myth" that the New Left effectively sputtered out in the 1960s. This is to say nothing of Kirkpatrick Sale's far superior 1973 treatise on SDS, which has held up well over the years and still far outshines Years of Hope, Days of Rage as a history of that organization. In true 60's tradition, I don't remember much about this book, but I do remember that I finished it, I enjoyed it, and it taught me the phrase "red diaper baby." Addendum to the review that follows: I managed to forget one of the things that irritated me most about the book, which is that Gitlin pays almost no attention to Vietnam veterans, who make their appearance only very late. A clear reflection of his, and the New Left's, insular qualities. I've changed my mind and am reducing the rating to two stars after fall. Very difficult book for me to evaluate with anything resembling "fairness," which is appropriate for a book that looks at the 1960s from th Addendum to the review that follows: I managed to forget one of the things that irritated me most about the book, which is that Gitlin pays almost no attention to Vietnam veterans, who make their appearance only very late. A clear reflection of his, and the New Left's, insular qualities. I've changed my mind and am reducing the rating to two stars after fall. Okay, the problems. My intellectual and activist foundation is in African American Studies and, once the story moves beyond Freedom Summer, Gitlin's flat-out awful on race. He reduces Black Power to the Panthers and a sort of exclusionary black nationalism that was highly visible, but nothing resembling the full story. He just doesn't have much nuance on where civil rights came from and he knows next to nothing about the complexity of the South. The book does a great job reflecting the white left's confusion, but he misses a whole lot. (He even fails to acknowledge that Stokely Carmichael's line about the position of women in the revolution being "prone" was said in jest.) Second, his chapter on women is embarrassing. He begins by patting himself and the New Left on the back for their egalitarianism and for taking women seriously. Then he presents some of the evidence that demonstrates the depth and breadth of women's dissatisfaction with the left. He sort of knows this, but can't quite bring himself to admit how bad the problems were. More importantly, Gitlin pays attention to women *only* when they're involved with left politics. The Sixties is a boy's tale in ways that aren't inevitable. For instance, he says nothing at all about women on the right. That ties in with yet another problem, which is that Gitlin reduces his portrayal of the right to the standard series of cartoon villains: Goldwater, Nixon, Agnew, Reagan. If the book's actually what it claims to be, the right is a much much bigger part of the story. Even as a history of "the movement," I find Gitlin unsatisfactory. He draws a strict line between the serious thinkers and activists of the New Left and the self-indulgent fuzzy-thinking hippies of the counterculture. For me, that was much more complicated. Part of that's regional. Gitlin's Harvard roots reveal themselves regularly. He sees the arrival of midwesterners (by which he basically means people from the Great Lakes region) in SDS as the beginning of the end. He takes the elite Ivy League schools, Michigan and Berkeley seriously with brief nods to Madison, Kansas and Austin. But his "New Left" is essentially a group of insiders who talked with, worked with, and often slept with one another. The fact that they thought that they were the big story is part of why their version of the movement didn't work. At times, Gitlin's reports on the sectarianism and ideological debates within the New Left became as difficult to slog through as the speeches were to listen to back in the day. My final complaint is that Gitlin's taste in music is really narrow in ways that aren't trivial. There's one passing mention of Aretha Franklin in the book, none of James Brown. I only remember a single mention of Motown, none of Curtis Mayfield. Because he's committed to the tragic narrative of the New Left, he can't hear the political anger in Creedence (who he blows off as part of music's retreat in the 1970s). This isn't just a music-lover's complaint. Music was central to every part of the 60s I lived through. Where I was--editing an underground newspaper and playing (very bad) organ in a rock band in Colorado--the Counterculture wasn't an apolitical withdrawal and music was the point of connection. When I ordered this book, I had expected to enjoy it or at least find common points of reference (I am of an age!). Then, when it arrived and I saw the size of it, I decided I would have to skim read and focus just on those sections that most grabbed my attention or accorded with my own experiences. In the end, I was hooked and read the whole of the 220K+ words. Gitlin hones beautiful sentences and maintains this style throughout his detailed history of the politics of 'the Left' and the 'counter When I ordered this book, I had expected to enjoy it or at least find common points of reference (I am of an age!). Then, when it arrived and I saw the size of it, I decided I would have to skim read and focus just on those sections that most grabbed my attention or accorded with my own experiences. In the end, I was hooked and read the whole of the 220K+ words. Gitlin hones beautiful sentences and maintains this style throughout his detailed history of the politics of 'the Left' and the 'counterculture' through the tumultuous sixties. As an early president of 'Students for a Democratic Society', he is well-placed for this role. The struggle for racial desegregation in southern states of the US and the growth of the anti-Vietnam War movement dominate the first half of the book while the latter part details the splintering of these into various competing and sometimes mutually-antagonistic factions. Gitlin skillfully weaves elements of memoir and personal recollection into this huge history and does not disguise his own despair at the growth of violence and nihilism at the end of the 'Sixties Dream'. He does, however, finish (the book was first published in 1987) with the enduring achievements of this much-discussed decade - the women's movement, environmentalism and gay rights. Because of Gitlin's deep involvement in SDS, this is the most personal of the major books about the Movement. I made lots of comments in the margin, often arguing with his conclusions, which is a good sign of how he engaged me. I was quite moved by his concluding sentence: "'It was not granted you to complete the task,' said Rabbi Tarfon nineteen hundred years ago, 'and yet you may not give it up.'" We need to keep on resisting, hoping, and dreaming. Gitlin's focus here is the student protest movement and how it splintered, rather than a '60s overview. Well written, informative, surprising at times (the Kennedy brothers weren't well regarded by activists), but too dense in its details of the movement for the casual reader. Only a sociologist could make interesting material boring. The author gives the reader of the culture of the decade that changed America. Young people protested the Vietnam War for they felt it unjust in killing women and children in a foreign land. Our soldiers coming home were disrespected and spit upon and called baby killers. Drugs and the counterculture set the tone for liberalism. Students protested the bureaucratic system at the Universities and creating groups to fight and be recognized for their rights and music became of communicating how some The author gives the reader of the culture of the decade that changed America. Young people protested the Vietnam War for they felt it unjust in killing women and children in a foreign land. Our soldiers coming home were disrespected and spit upon and called baby killers. Drugs and the counterculture set the tone for liberalism. Students protested the bureaucratic system at the Universities and creating groups to fight and be recognized for their rights and music became of communicating how some felt while some music could represent rebellion against the mainstream culture of 1950's straight and narrow mind set. Young people wanted freedom and took every chance they could to just that express yourself through fashion, music, and personal beliefs, protests. Gitlin also puts his own personal experiences of that decades in the book which gives it a human element. The 60's changed America in what it believed in and what they thought was right through changing the systems that were once the backbone of America. The 60's was a turbulent decade with many changes that shape our nation today. There were assassinations which shock our national security because their were only questions that led to conspiracy theories. Gitlin gives you a comprehensive view of all the organizations created and how the culture developed and what their message was. How the 60's culture took us on a ride of uncertainty but also gave a voice to speak out and create ideas that cultivated dramatic change. While I was growing up Dad subscribed to Consumer Reports. Well, he didn't actually subscribe. He actually would sell ten subscriptions a year, mostly to colleagues at work, then get his subscription for free. In bad years he'd buy gift subscriptions for friends and family in order to get his "free" one. I was introduced to The Guardian, an independent radical newsweekly which published from 1947 through 1992, in high school. In college, it being my favorite leftist rag, I got my own "free" copy While I was growing up Dad subscribed to Consumer Reports. Well, he didn't actually subscribe. He actually would sell ten subscriptions a year, mostly to colleagues at work, then get his subscription for free. In bad years he'd buy gift subscriptions for friends and family in order to get his "free" one. I was introduced to The Guardian, an independent radical newsweekly which published from 1947 through 1992, in high school. In college, it being my favorite leftist rag, I got my own "free" copy by selling a bundle of maybe a hundred of the things every week. This was accomplished by standing nightly at the line leading to the south campus refectory, cajoling my fellow students to purchase copies while keeping half an eye on the ABC-TV News in the lounge. Sales would start at something like a quarter, then go down to a dime as I tried to unload the last few items. Somehow, I always managed--quite an accomplishment given that Grinnell had no more than 1200 students. It was weird reading about the creation, growth and self-destruction of the radical left from the perspective of the radical-right dominated 2014. Gitlin's detailed, up-close-and-personal history is enlightening, sad, perceptive and a warning of how far we've come. What was once a legitimate opposition would look foolish and be called terrorists by today's conservative-dominated media. As much as the New Left was spied on, harassed, antagonized into fracturing, today they would probably just be It was weird reading about the creation, growth and self-destruction of the radical left from the perspective of the radical-right dominated 2014. Gitlin's detailed, up-close-and-personal history is enlightening, sad, perceptive and a warning of how far we've come. What was once a legitimate opposition would look foolish and be called terrorists by today's conservative-dominated media. As much as the New Left was spied on, harassed, antagonized into fracturing, today they would probably just be turned over to the open-carry movement for target practice. Meh. Way too densely packed with detail about the SDS and other revolutionary groups. I was expecting this to be a broader history book; instead it's a memoir that only a small group of people can probably appreciate. I suppose if you were a member of these organizations, you'd care to read hundreds of pages about the bickering and in-fighting between individual group members. What this has to do with the general decade of the 1960's I have little idea. I skimmed a lot of it and gave up. Another Meh. Way too densely packed with detail about the SDS and other revolutionary groups. I was expecting this to be a broader history book; instead it's a memoir that only a small group of people can probably appreciate. I suppose if you were a member of these organizations, you'd care to read hundreds of pages about the bickering and in-fighting between individual group members. What this has to do with the general decade of the 1960's I have little idea. I skimmed a lot of it and gave up. A very detailed account of the decade, especially inside the radical student movement and the hippie/yippie dissenters. Like Charles Kaiser's book, it was published in the late 1980s long enough after to permit some reflection, some might say revisionism. This book covers some of the same events with more of the context. I enjoyed reflecting on the events myself after even more time has passed. It was surely a tumultuous decade. Like any generation in the modern time, we made some goofy, naive m A very detailed account of the decade, especially inside the radical student movement and the hippie/yippie dissenters. Like Charles Kaiser's book, it was published in the late 1980s long enough after to permit some reflection, some might say revisionism. This book covers some of the same events with more of the context. I enjoyed reflecting on the events myself after even more time has passed. It was surely a tumultuous decade. Like any generation in the modern time, we made some goofy, naive mistakes. Who from the next generation shall cast the first stone? Give this book a chance. It's slow at times and not as detailed at other times as one might like, but its coverage of some events of the 60s (Columbia University sit-ins, the events of 1968, rise of Weather Underground, problems within SDS) are really riveting. And I like the conclusion where he tries to put all the puzzle pieces together in the messed-up decade of the Sixties. A little too philosophical at times, but wasn't that what the Sixties were all about? Well, this book just wasn't what I thought it was going to be or be about, even...completely focused on "New Left" movement of the 60s, which was kind of interesting and is definitely essential to understanding the political landscape of that time. However, it's not what I had in mind and frankly, it gave me a headache. I felt like I was doing homework. Meet the first book I've ever returned to the library without finishing it. There's a reason you'll find Gitlin quoted in most books written on the Sixties: he was in the thick of things, and he's a sharp, incisive writer. 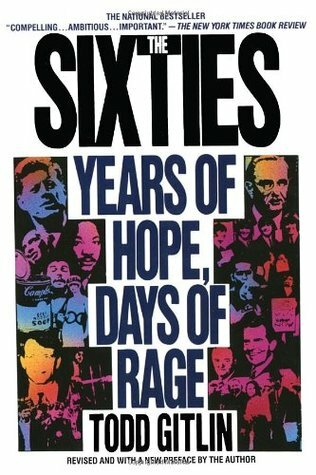 While the book is not without its problems (the gender politics are badly outdated; it's worth remembering this was written in the 1980s), his account of the ebb and flow of radical politics in the most (in)famous decade of the 20th century is vivid, compelling, and disturbingly relevant 50 years on. Gitlin is organized and thorough, but the material is a little dense. I originally read parts of this book in a college course and have returned to it chapter by chapter over the years. I assigned parts to my students, but they would have been better off with more general readings. Gitlin is a good writer, however, and it's the best read of books of its kind. Whenever I forget the names of the founding SDS members or the Chicago Eight, I don't panic, but reach for the Gitlin. I don't mind an undisciplined sentence or six--but after a while I yearn to break out the whip! This book is interesting when Gitlin isn't discussing himself and his own experiences in the 60's, but when he's knee-deep in info about the SDS. . .well, there's no need for warm milky beverages to put me to sleep. All I can say after reading this massive tome is that Mr. Gitlin's sixties were different from mine! I guess I was one of those people he talks about who took no interest in politics and wandered off in search of themselves. Not such a bad thing to do Todd, really! That being said, if you want a reasonable history of the SDS by someone who was involved in it then this is probably your book. As with And the Crooked Places Made Straight I read selections from this about 10 years ago and cannot remember the details. I have the impression that this text felt more "academic," and probably less accessible to the general public, but otherwise an interesting and broad history of the 1960s in the United States. This is really a 3.2 rating. This book truly has surprisingly thrilling and interesting moments. However, the writing style that engages in excessive navel gazing detail and pandering rhetoric, suffocates them, rendering an otherwise brilliant work into a sadly boring one. I still think is worth reading it but simply fast forward to the more historical parts. Super frustrating endnotes. Gitlin is a great writer that uses imaginative metaphors though out his history. His less than radical liberalism is tough to forgive, coming from such a radical background as SDS. Todd Gitlin is an American writer, sociologist, communications scholar, novelist, poet, and not very private intellectual. He is a professor of journalism and sociology at Columbia University.